In the 90s, I spent a lot of my weekends at my friend Derek’s house. He had very generous parents back then… generous enough to buy all the cool stuff I always wanted but never got. From the expensive Nerf guns, Power Ranger weapons, to the Pog collection in the neighborhood, It was easy to be jealous of the guy. For some time, the thing the other kids in the neighborhood envied the most was the Sony PlayStation. He was the first kind in town to get one, and we all wanted to try it. Thankfully, Derek loved to share, so he loved inviting us over and letting us play. The game we played the most was undoubtedly Twisted Metal. The vehicular combat genre was not exactly new at the time, but Twisted Metal was the first exposure most of us had to game that let us drive ice cream trucks with machine guns on them. Frankly, it was all we wanted to play. Not long ago I loaded up Gas Guzzlers Extreme by Gamepires/Iceberg Interactive and was immediately transported back in time to those nights playing at Derek’s house. The game takes a great formula and puts modernized concepts on top to make it an instantly addictive and destruction filled humor extravaganza. From the race modes to capture the flag, the DNA of all vehicle combat games that came before courses through the veins of this one. Add in vehicle customization options, funny announcer voiceovers, online multiplayer, and great visuals, you suddenly have a game that any gamer would be hard-pressed to say needed more. It is virtually a complete package of driving and combat, built to satisfy the itch that fans of the genre have. It is an experience that mirrored those times that got someone like me into gaming in the first place. In February, the “Full Metal Zombie” expansion pack was released, and in many ways, re-invented the game. Adding to the already feature-rich Gas Guzzler arsenal of game modes, Full Metal Zombie adds two more: “Survival” and “Defend the Base”. Additionally, a large new arena was added, a new car and additional skins, and a bevy of Zombie models designed to change up the formula considerably. Survivor mode tasks you with surviving wave after wave of zombie onslaught while outscoring other players, while Defend the Base has you keeping zombies from destroying… well… your base. Enemies feature a variety of zombie forms ranging from your traditional walking dead to fast moving beasts, and even larger boss-like creatures wielding car parts.. I found myself laughing out loud many times while I played these modes, mostly because every situation I got myself into seemed to end up ending comically bad for my vehicle. Each time I died was at the end of a frantic race to get more ammunition, steal a kill from an ally, or just plain survive the wave. My stand out moment came during the first time I played survival mode. I found myself in a tiny beetle-ish car strapped with mini-guns, driving around looking for packs of undead wandering in the desert. Wave after wave of zombies poured into the arena as quick as they were eliminated, getting more aggressive with each one. There were competitive A.I. opponents in the field too, racing to kill as many as they could in an effort to outscore everyone else. Ammo refills and explosive barrels were strewn around the landscape, as well as a number of destructible objects as part of the environment. As you expend ammo, finding refills becomes a priority, but this particular effort became complicated once a zombie dog decided to hit me hard enough to flip my car. It was a level of destruction and craziness I did not encounter up until that point, and I was genuinely startled when two fast moving zombie bison (at least, I think they were bison…) decided to T-bone my overturned car from both sides simultaneously. I immediately burst into laughter. The whole series of events was ridiculous, and fun to watch happen as I helplessly pecked at the keyboard to try and flip my ride. 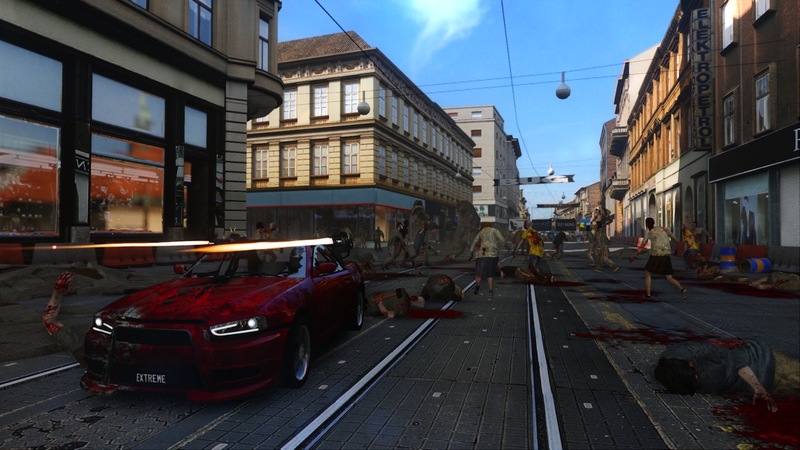 As I played, my car took lots of damage and sported plenty of blood and gore from the ongoing zombie roadkill action. Eventually the waves of enemies increased to a point where the situation was very dire and I ended up running away from enemies more than anything in order to avoid getting exploded. It was good fun, and it made me wish there were more varied environments the game allowed you to use for this mode from the start of the game. You can unlock more cars and maps if you play the game’s campaign mode though. 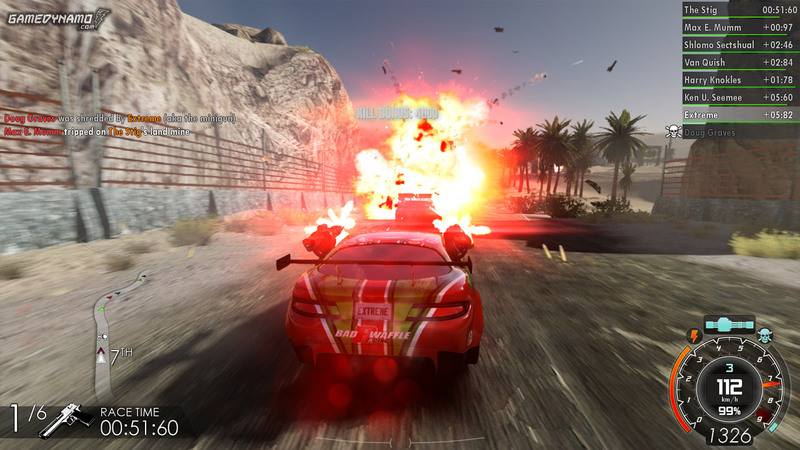 The game’s multiplayer also includes race and combat modes found in the original release, and allows A.I. controlled players to fill in the slots of human opponents in both cooperative and competitive capacities. There were times I found myself attempting to find matches online and had to use computer players because there were not enough humans around to fill those slots. Either way, I spent more time in modes like survival where other cars we not the targets, so A.I. players really didn’t detract from the experience. They were smart enough to steal kills from me, I suppose, but not enough to get in the way of the main objective. Still, they stole my kills. That made them all enemies in my eyes, human controlled or not. I should also mention that I enjoyed the game much more once I hooked up a controller. The keyboard controls do work and are completely customizable, but didn’t seem to offer me the precise control I needed to really master the handling of the cars. A thumb stick and trigger set improved my experience significantly. Even with the controller though, the cars are a bit weighty and seem to bounce off some objects in the game’s courses, making it seem a little cartoonish and jarring at times. Turning was sluggish until I moved away from the keyboard, and even then there were times where I found myself trying to get the car to handle in ways the game simply would not let me. Don’t look for simulator style driving here, but instead an arcade feel that, when you get the controls to your liking, works well enough for the gameplay. Graphically, the game is very well presented. 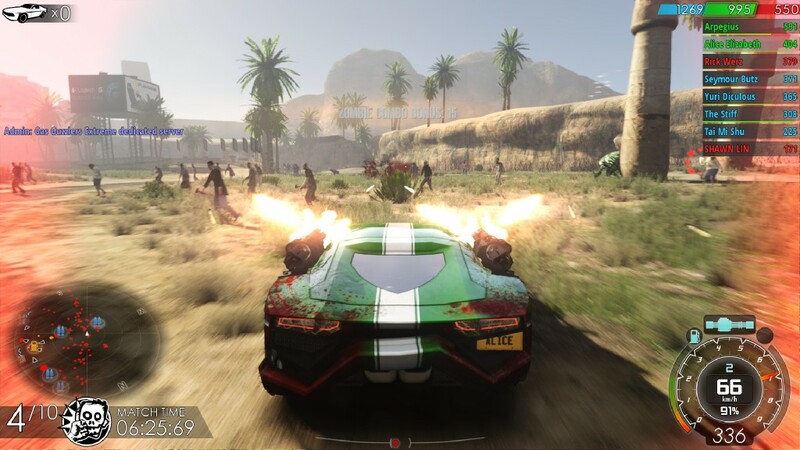 The environments are colorful and varied and the cars are shiny (or bloody) and easy to customize. Even on lower graphic settings the game looked good, and I did not see too many graphical slowdowns when the area filled up with more zombie, cars, explosions, or other environmental items. The maps are large enough for the plethora of game modes, but new map included with Full Metal Zombie called “Warburg” works best for the Zombie modes due to its size. The game itself is a great pickup for fans of racing, combat, or the combination genre that was so well established by other franchises. I highly recommend any player who decides to jump in also get Full Metal Zombie when they do. I know earlier I mentioned that the base game is very content-rich, but having played a lot of Survivor mode, I don’t think I could go back and play a version of the game that doesn’t include it. While the multiplayer can be a bit empty at times, the A.I. is more than enough to fill out the space and provide a competitive side to any mode you enjoy. Gas Guzzlers Extreme fills a gap in my gaming history that I’ve had since I was a child, and the Full Metal Zombie expansion adds the blood, gore, and survivalist aspect that sets it apart from other games in the genre.. I still envy Derek because of all the stuff he got while I was forced to wait 20 years to have that experience for myself. That said, I got a Dreamcast in 1999. Derek was super jealous.